Olympic Hot Tub is proud to announce it has been inducted into the AQUA 100. 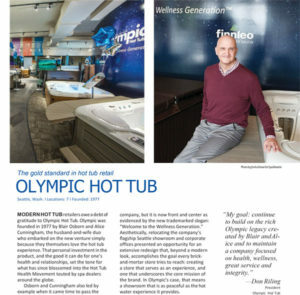 March 19, 2019 – SEATTLE, WASH — Olympic Hot Tub is proud to announce it has been inducted into the AQUA 100, an exclusive honor bestowed to just 10 North American pool and spa retailers each year. The AQUA 100, presented by AQUA Magazine, is an industry-leading competition designed to honor excellence in pool and spa retail. In light of the adversity specialty retailers of all kinds have faced over the past decade — the rise of online shopping, the pressure of a recession — the AQUA 100 honors the diamonds of excellence that have not only survived, but thrived, proving once and for all the spirit of brick-and-mortar businesses will carry on. The application process was rigorous, requiring entrants to provide detailed information on company history, customer service, store design, digital presence, marketing and community involvement, complete with supporting documents. Applicants were judged by an independent panel of retail experts. Since 1976, AQUA Magazine has been the leading trade publication for pool and spa retailers, builders and service professionals. 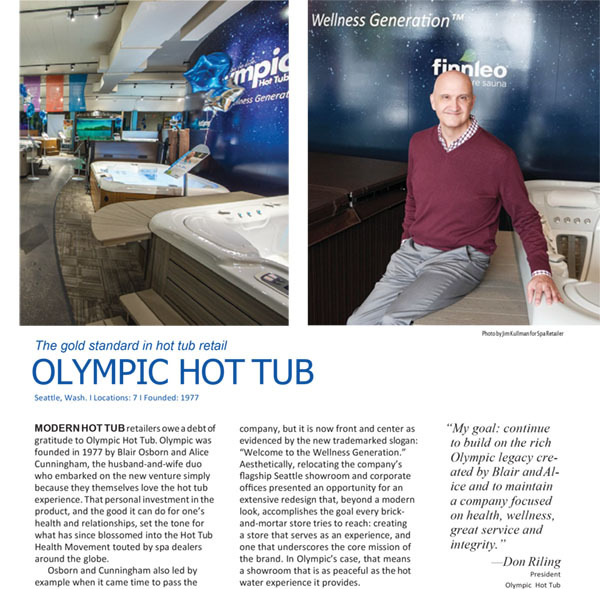 Each month, thousands of pool and hot tub pros turn to the online and print pages of AQUA for its valuable mix of news, trend and product coverage.